The real pane of having multiple mailboxes is the need for their constant checking. The real pane of having multiple mailboxes is the need for their constant checking. Don't you just hate having to do this many times a day? Opening your web browser, remembering and enter passwords. Well MultiMail application will make this process much faster. You just simply add the details of your hotmail accounts to this program and you will never have to type your email address and password again. When you want to open your mailbox simply select the address and MultiMail will launch a new webpage entering your username and password automatically, taking you directly to your mailbox. If you�re worried about others launching the program and having access to your email accounts then don�t. 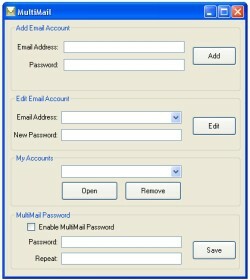 MultiMail has an optional password entry system, so you can protect your account details. Simplest to use, high quality, a really effective time saving tool!